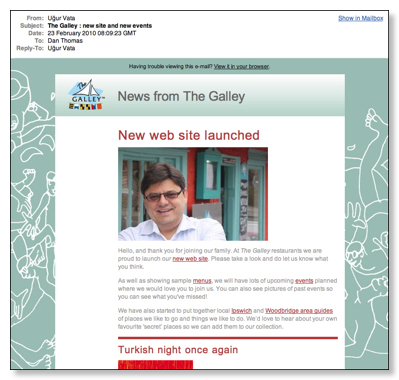 We re-designed The Galley restaurant’s web site back in February and have been adding new content ever since. 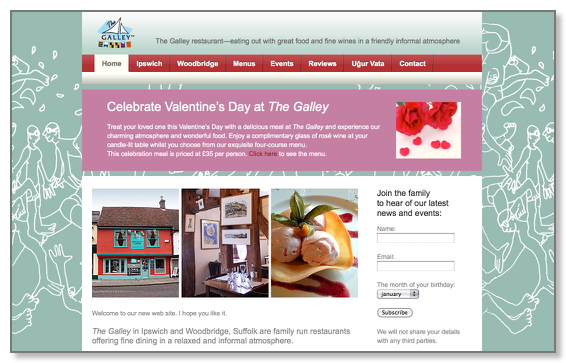 The Galley restaurants, located in Ipswich and Woodbridge, came to us needing a new web site, wanting something more accessible and in keeping with their friendly family atmosphere. The new site features menus (that are editable by the client online), along with news of future and past events, reviews and contact details. The restaurants don’t have internet access so we also set up an online booking system that sends customer’s reservation requests via SMS (text message). Finally we have also set up Google Analytics to monitor the number of hits and sources of traffic.